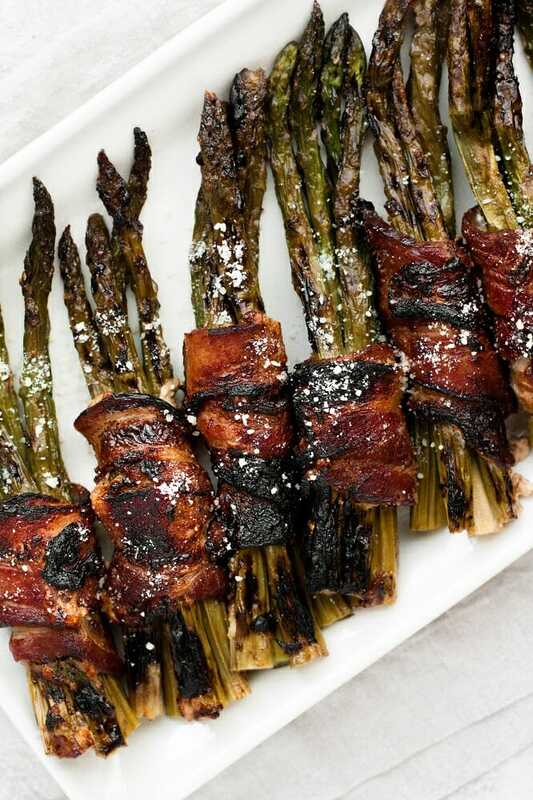 Ready in under an hour, these Bacon-Wrapped Maple Parmesan Asparagus Bundles are a delicious and keto-friendly party appetizer, tailgating treat, or side dish option that is full of flavor and low in carbs! This recipe is a great option to have on-hand for those gatherings you want to bring a dish-to-pass to! 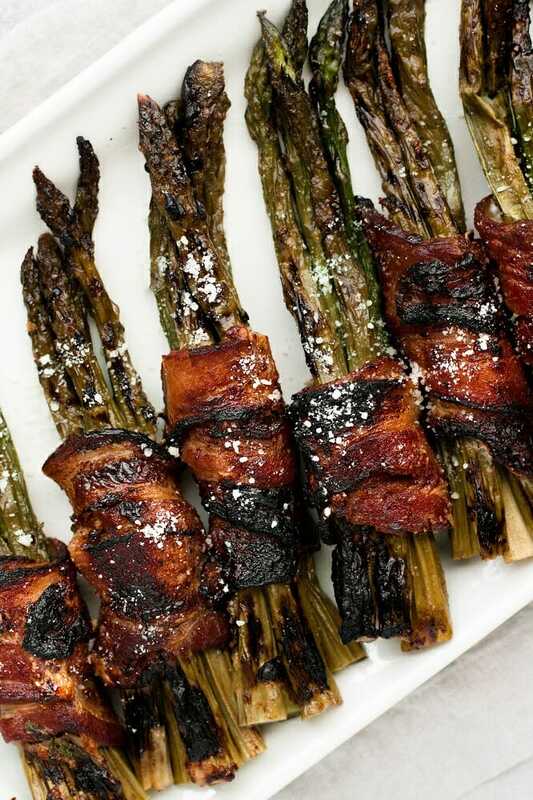 Since the asparagus bundles are wrapped in bacon, they are easy to grab and will stay bundled together on your plate, making them a perfect holiday appetizer! Since maple syrup is high in sugar and carbohydrate content, I substituted Lakanto Maple-Flavored Syrup in for sweetness in this recipe. 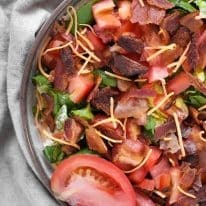 I love having a bottle of this in my pantry for enhancing the flavor of bacon or to drizzle on top of my Low-Carb Pancakes or Vegan Keto Baked Pancakes! Lakanto’s Maple-Flavored Syrup is sweetened with monk fruit sweetener, a naturally-occurring, net-carb-free, and zero calorie sweetener. In addition to the syrup, we also use Lakanto’s granulated Classic Monk Fruit Sweetener and Golden Monk Fruit Sweetener daily. Lakanto products are my personal favorite pantry-staples since I began a ketogenic, primal way of eating! Read more about and place your order for the Taste Test Bundle! The process of prepping this recipe couldn’t be easier! Minimal cutting or chopping needs to be done and, once the bacon is wrapped around the asparagus and sprinkled with some grated parmesan, these little bundles will be ready for baking! The best part of all though? From start-to-finish, the recipe is ready in under an hour! 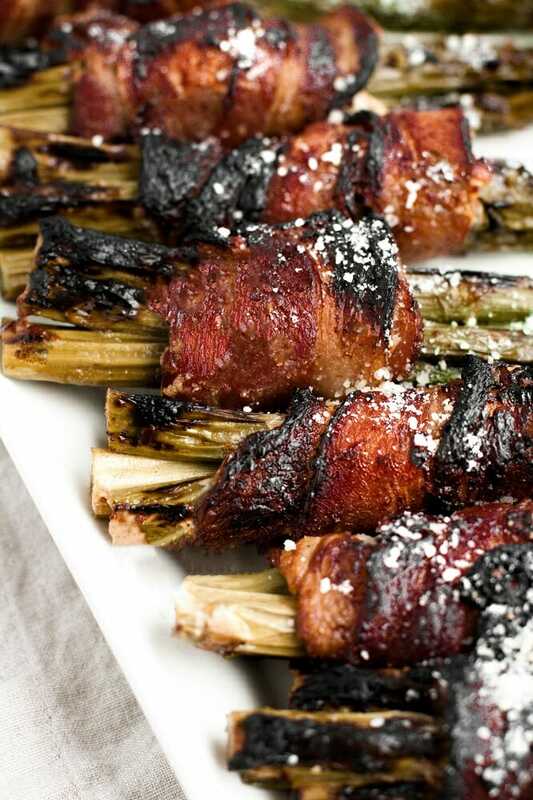 These Bacon-Wrapped Maple Parmesan Asparagus Bundles are a compliant dish for many diet lifestyles! 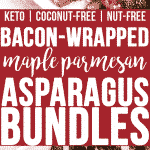 Keto and Low-Carb: These Bacon-Wrapped Maple Parmesan Asparagus Bundles are low in carbohydrates and are very keto-friendly! One serving contains only 2.9 grams of net carbs. Egg-Free: This recipe is made without any egg-containing products. Coconut-Free: There are no coconut products in these asparagus bundles. Refined-Sugar-Free: These are free from refined-sugar as the sweetness and maple flavor in this recipe comes from monk fruit-sweetened maple-flavored syrup. 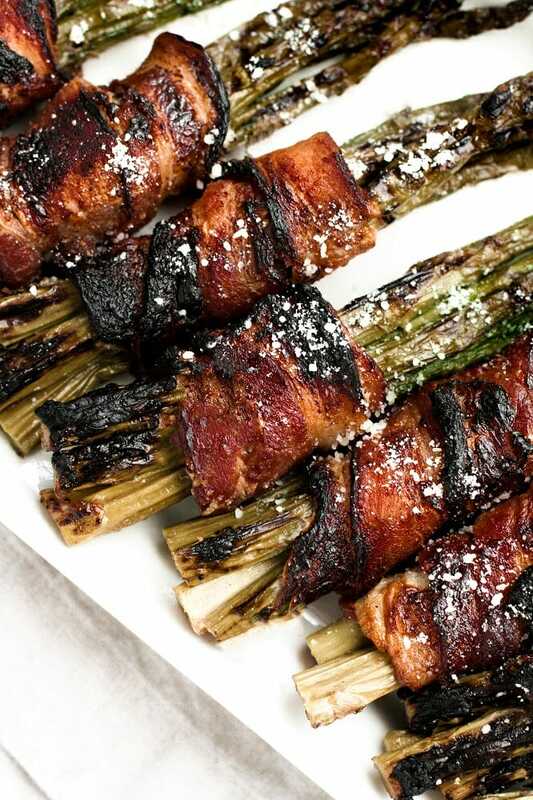 These Bacon-Wrapped Maple Parmesan Asparagus Bundles contain only 2.9 grams of net carbs per serving! The recipe yields 8 asparagus bundles. This recipe is keto, low-carb, nut-free, egg-free, coconut-free, gluten-free, grain-free, and refined-sugar-free. 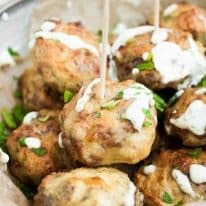 Find more keto-friendly meals by browsing my keto recipes! These Bacon-Wrapped Maple Parmesan Asparagus Bundles are a delicious low-carb and keto-friendly party appetizer! This recipe is keto, low-carb, nut-free, egg-free, coconut-free, gluten-free, grain-free, refined-sugar-free, and contains only 2.9 grams of net carbs per serving! To a small pot over medium low heat, add maple-flavored syrup, butter, salt, and pepper and bring to a light boil, whisking occasionally. Remove from heat and set aside. Split asparagus stalks into 8 groups. Wrap bacon slices around grouped asparagus stalks, starting about 1/2 inch from the bottom, and secure bacon slice with toothpick. Transfer bacon-wrapped asparagus bundles to casserole dish. Pour syrup mixture into casserole dish atop bundled asparagus and sprinkle half of grated parmesan (~10g) on top. Bake for 35-40 minutes. While asparagus bundles cook in oven, place baking rack atop a foil-lined line baking sheet. Remove casserole dish from oven and transfer baked bundles to prepared baking rack (rotating them so the side that was baked down is now up), turn on oven broiler, and broil until bacon is crispy, about 1-2 minutes. Remove baking sheet from oven, remove toothpicks from bundles, sprinkle remaining grated parmesan on top, and allow to cool slightly prior to serving.